You can, unless your cheeks are covered with very serious cystic acne full of pus. However, a 0.5 mm size helps with pigmentations and post acne spots and an overall skin tone and texture but if you have scars, it needs longer needles. Buy a 1.5 mm dermastamp with 35 needles and stamp your scars densely every three weeks. Dermarolling / Microneedling / Re: Horrendous Stretch marks..
We sell it to the UK (again). Dermarolling / Microneedling / Re: Correct needle size for face? Single needle or 1 line roller for body? For the time being, do not buy anything. Try dermarolling for your eyes and scars and if it goes well, buy a regular 1 mm dermaroller for the whole face. better product penetration under the eyes to combat dark under-eye circles. How often can I treat the face/ under eyes? I suggest a regular 0.5 mm dermaroller. Later you can go for size 1 mm. >Am I correct in saying the lips should not be rolled at all, because the skin is so thin? We do have customers who dermaroll their lips but you have to use shorter needles because the skin is thin. Use your 0.5 mm dermaroller. >I also have some scars from cuts on the forearm, just below the elbow. Is the 1.5mm roller sufficient for this area or should I only use the single needle? how often can these scars be rolled/needled? Use your 1.5 mm dermastamp on them every three weeks. Stamp densely. You can use it daily but I am afraid this frequency may lead to breakouts. Our Tretinoin cream prevents the formation of blackheads and it keeps acne under control but it makes the skin dry so you have to moisturize a lot. You can for example try using Tretinoin twice or three times a week and the oil method once a week. No, I do not think it matters what kind of oil you use but you should add salicylic acid. Yes, it is normal because the skin is being renewed and the old skin peels off. This peeling is not always clearly noticeable but it is happening. It makes the skin temporarily very dry and wrinkly. You must keep the skin moisturized as much as possible for days after the microneedling session. One of the best skin moisturizers is almond oil. Wet a cotton pad with tap water, add some almond oil and clean your skin with it or apply it on your skin. You can even quit dermarolling and do only dermastamping if your skin "does not like" dermarolling. You do not need copper peptides but you do need Infadolan. You should follow more or less the routine that is in the link I have given you. That includes Tretinoin and Infadolan. OwnDoc dermarollers are very good. In fact, OwnDoc rollers have better needles, since for the past 18 months we've occasionally seen reports of bent needle tips in new Dr. Rollers. That's why we're phasing them out. The difference between Dr. Roller and an Owndoc dermaroller is that Dr. Roller has a slightly more robust rolling mechanism but you have to replace your dermarollers when they get blunt so you cannot use the same dermarolling instrument for years anyway (if you use it frequently). The most important part of a roller is good quality needles and Owndoc dermarollers have good quality needles. You can do all your stretch marks in one session (approx. every 4-6 weeks, depending how quickly your skin heals and how deep and densely you stamp) but only if you have time and energy to do them all thoroughly and densely. Stamping will make the stretch marks temporarily more red but long term it helps fading the purple color of fresh stretch marks. Do a test patch first. Do not stamp all you stretch marks the first session. I had red fresh stretch marks that i rolled once a month with the 1.5 mm dermaroll. Great improvment. The size is reduced by 50% and the redness turnes to a white" raised worms". The outermost layer of the skin has a barrier to prevent water evaporation from the skin. This barrier is temporarily compromised after microneedling and that is one of many reasons why the treated area should be kept moisturized, preferably with something that acts as a barrier (semi-occlusive). Semi occlusive creams, oils can however sometimes causes breakouts in acne prone individuals so acne prone individuals should use (on the face) any cream that they know from their experience does not break them out. On the body, everybody should keep the treated area as moisturize as possible – for example with our Infadolan ointment that is semi occlusive or with oils. You will certainly get results without keeping the area moisturized but your goal is to establish good conditions in the skin and dried out skin is for many reasons not an ideal condition for the processes in the skin after microneedling. I suggest a regular 1.5 mm dermaroller and a 1.5 mm dermastamp and our 0.1% Tretinoin cream. You do not needle or stamp the same stretch mark every day. You can stamp or needle every day but every day a different stretch mark. Each stretch mark should be treated once a month. Stamping or needling stretch marks should be done very densely and very thoroughly. If you have just a few stretch marks, you can do them all in one session but if you have many stretch marks, it is wiser to spread t out. For example, you have 60 stretch marks. Stamp every day 3 stretch marks until they are all done in 20 days. When your dermaneedling instruments get blunt, you can always go for size 2 mm in the future but do not start with this size. It is really difficult to answer your question because vit. C has to have a low pH to be able to penetrate the skin and I do not know how the added ingredients affected the pH. Our vit. C is pure ascorbic acid. Your vit. C has added ingredients and some may enhance oral penetration but they can also decrease topical penetration. For example, sodium bicarbonate enhances the oral absorption of vit. C but it decreases its topical penetration. You would have to ask the manufacturer of your pills whether it is suitable for topical penetration. As I said before, I can't be expected to know everything about every product out there, neither can I be expected to put in the research required and write up the answer. Again, I am sorry but the alternative is to close this forum. But you could for example use your pills in freshly made salads, to prevent the oxidation of vegetables. Dissolve a pill in a little water and add it to your salad, together with dressing. I routinely add vit. C to my salads. You can of course use it on your skin but I cannot guarantee it will penetrate. I just don't know - it's not our product. If you split your pill and take a half or a quarter, your stomach will likely be able to handle it. There is no need to take 1 g in one go. Yes, you should wait because it may still completely heal to normal. Wait at least one month. If there is still a scar, buy a 1 mm dermastamp and stamp it every 10-14 days. 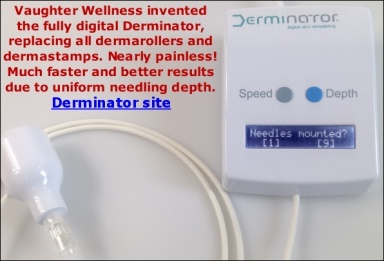 First of all, you really should add a 1.5 mm dermastamp with 35 needles to your dermarolling sessions. A combination of a dermaroller and a more targeted instrument (such as a dermastamp) proved to be the most effective. During the same session (every three weeks), stamp the scars and then roll them. If you have too many scars, you do not have to treat them all in one session. You can treat one cheek, as soon as it heals, treat the other, when it heals treat the temple etc. If you have the rolling type of acne scars, add our suction pump because this type of scars is usually tethered to the underlying structures and the pump will help releasing the fibers. Scars are a difficult problem and various approaches and a little improvisation is often needed to achieve results. If you also have the boxcar type of acne scars, you can for example try inducing intensive peeling by applying the A-Ret cream (we sell it) right after microneedling (it stings and it irritates the skin). Do a test patch first to see how your skin reacts. There is no problem with treating scarred and non-scarred skin at the same time because the scarred skin has tendency to level up to the surrounding skin, no matter whether the surrounding skin is treated or not. You should however concentrate on the scars as much as you can because scars really need intensive treatments and it sometimes takes a long time to improve them. I think that using 30% salicylic acid weekly is overkill. Salicylic acid is really great for unclogging pores because it is fat-soluble and it gets inside the pores but you perhaps should use a lower percentage. If you have good experience with this strength, applied weekly, then continue but as mentioned before, your skin seems to be "over-exfoliated". You can apply the peel when the skin is more or less healed from the stamping/rolling (when the swelling, redness, tenderness and dryness are gone). Also, do not microneedle unless the skin is healed from the peel. Remember, the more is not always the better. Dermarolling / Microneedling / Re: Combine dermastamp and dermaroller? You can stamp with a 1.5 mm, two weeks later roll with a 1 mm, a week later stamp, two weeks later roll and so on. You can also do it as you suggested. You are brave because from my experience this area is painful to microneedle even with a numbing cream. Ibuprofen and other nonsteroidal anti-inflammatory drugs reduce blood clotting and thus increase bleeding. Fish oil supposedly also reduces blood clotting. They should be avoided prior to major surgeries where significant bleeding is expected. Microneedling only involves very minor pinpoint bleeding so it is not really contradicted but to reduce/shorten the bruising, it is better to avoid them at least 24 hours prior to microneedling and right after.